An overall score of 25 may seem like this lens falls short of excellence; however this is partly down to the nature of super-telephoto lenses compared to shorter telephoto lenses like an 85mm. In reality, this is a fantastic score. 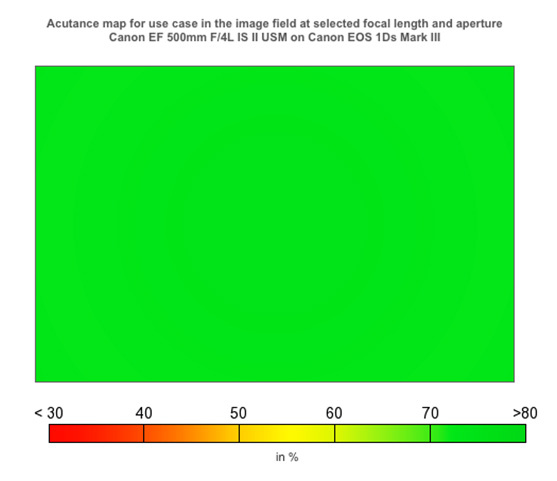 A sharpness score of 19-P-Mpix relative to the 22megapixels of the EOS 5D Mark III shows the lens is resolving incredibly well and crucially, there is less than 5% variation from centre to edge between f/4 and f/5.6 and less than 3% variation from f/5.6 to f/32. Even wide open at f/4, the sharpness is completely even across the frame. The transmission score is similarly impressive, showing little light loss and at 0%, there is no distortion at all. Equally, the chromatic aberration is so well controlled that you would not expect to see any in final image. 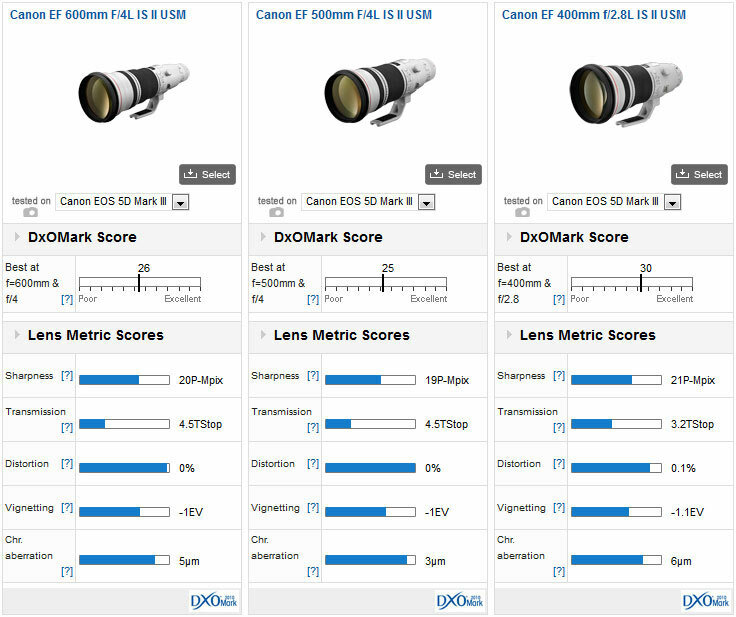 Like the 500mm lens, the 600mm is an exceptionally good performer, managing an almost identical set of scores, except for the fractionally high sharpness score (20P-Mpix vs 19P-MPix) and fractionally lower, though just as imperceptible, Chromatic Aberration score (3µm vs 5µm). Equally, the sharpness across the frame is just as even, with hardly any drop off from the centre to the edge at all apertures. 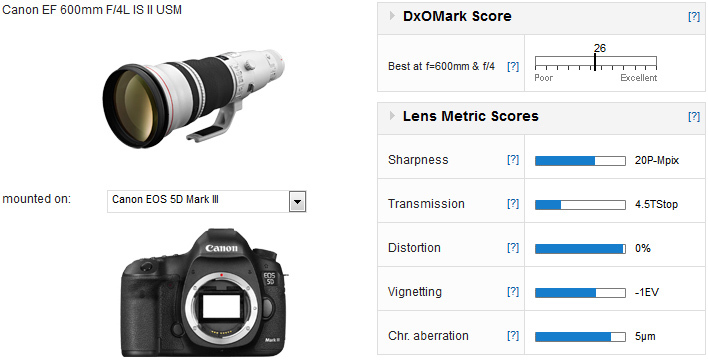 Looking at the results of telephoto prime lenses tested on the EOS 5D Mark III, both the EF500mm II and EF600mm II are within the top 6 best overall score and image sharpness. 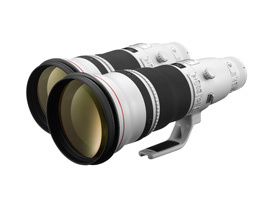 Putting these two lenses beside the EF400mm f/2.8L IS II USM lens that has also been through the labs, shows just what Canon have achieved with their Mark II super-telephoto lenses – they are as close to perfection as you can expect to get. Interestingly, the performance differences between the lenses are almost negligible and the only reason the EF400mm f/2.8L IS II USM comes out on top is down to the fast maximum aperture and hence better transmission score. Of course you would not usually be selecting between these lenses as their focal lengths have very different uses, however, as a comparison of what the best telephoto lenses can currently do, they make an exciting trio, any of which would be a worthy addition to your kit. Both of these lenses offer exceptional performance that far exceeds anything else available in a Canon mount. They are also built to last, with fantastic build quality. If you’re looking for the best, these should be at the top of your list. The only things to keep in mind is that they are both heavy lenses – though much lighter than their predecessors and not unduly heavy for a lens of this focal length and aperture – and they are also expensive, but the best usually is.